Before Gabriel went on a job interview, he wished he had some better way to get inside info about his prospective boss. Since Gabe didn’t belong to some old boys club. And Google could only get him so far. Mary resigned herself to online dating. Only she wished that she had a better way to pick and choose. Face reading could help. Particularly learning face reading from this book. Rose’s best yet, devoted 100% to this simple skill. Updating a 5,000-year old art of reading faces for character. Showing you a fascinating way to look at people differently. Then accurately interpret what you find. Through this book Rose Rosetree can fast-track you to knowledge about power style, conformity style, and plenty of other secrets. Info that you can either learn the hard way, over many months. Or else you can learn it the easy way. Quick insights, with built-in compassion and kindness. Of course this can help your relationships. There’s good reason why it’s called “The Power of Face Reading”! For this book, I was inspired to create a “Cast of Characters.” Quirky human faces! A bit like the group in Become The Most Important Person in the Room (another Rose Rosetree how-to). Each Cast Member is referred to repeatedly throughout this book, a big advantage for helping you develop skills faster. As you’ll see, the Cast of Characters makes it possible to provide loads of visual references without requiring separate photos for each example. (You can find the full Cast at the online Book Supplement page). If you were to follow the evolution of my Face Reading Secrets® books over the years, you’ll see an evolution of my skills as a teacher and writer. I do hope you will enjoy reading this new edition, as I did in writing it. Comparing this book to others, what will you find? Typically other authors give you bits and pieces, often taken from a range of different sources. By contrast, you can learn face reading from a master teacher. A coherent, buildable system that’s power-packed. The system of Face Reading Secrets®. Often imitated, never equaled. For instance, check on YouTube. Where you can find samples of Rose reading faces. By contrast, you’ll find others who lay claim to “The Power of Face Reading” and other discoveries Rose has made. Authorized editions of Rosetree’s face reading books have been sold in China, India, Iraq, Lebanon, Lithuania, Russia, Saudi Arabia, Slovenia, Spain, Switzerland, and The Czech Republic. Entertaining writing, yet with plenty of substance beneath the surface. Always seeking to improve how she writes her how-to books, Rose found a way to improve what she’d been doing so far. 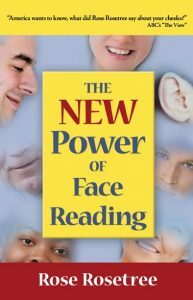 Hence the name, “The NEW Power of Face Reading.” This book gives you a new, sequenced teaching method that will help you to develop great skills easily. Appreciate ways that your face is perfect, just as it is, right now. Meet a wacky cast of characters who make face data come alive. Photos are easy to access, with clear examples of VERYS. Loaded with practical examples, humor, and passion for learning the truth about people. Discover facial anchors, major compassion awakeners, and more leading-edge discoveries. You have a face. Why not enjoy it more? Whether new to face reading or already a pro, you can learn so much from this definitive manual for Power-Packed Face Readers! Over the nearly 25 years since this book was first published in its original form as “I Can Read Your Face,” Rose has learned a lot about how to teach her system of Face Reading Secrets®. Partly she wanted a new Power of Face Reading how-to that would build in developmental levels for learning skills, along with adding every which way she could think of… to help readers get really good — fast — at physiognomy. As you’ll see often in this how-to, “Let’s Get Practical.” Because this book makes face reading easy and fun and definitely practical. What's In This New Edition? Open your heart with Rose Rosetree’s system of Face Reading Secrets®. Her update of the 5,000-year-old art of physiognomy can help you to communicate better, become more persuasive, make more friends. And did we mention have more fun? A new, sequenced teaching method will help you to develop great skills easily. Discover facial anchors, major compassion awakeners, and more leading-edge discoveries from America’s most experienced physiognomist. It’s the definitive face reading manual for today’s Power-Packed Face Readers!